We are in a unique time of historical change. Change always brings opportunities. For many the opportunity is expressed in saving the earth, or the dolphins, manatees, etc. For us in VPP, the opportunity comes in the form of raising awareness of peace. One approach we promote is to place peace poles in residences, schools, businesses, and parks. To date, there are at least 29 peace poles spread throughout Venice, 17 of them with VPP involvement. A peace pole is more than a symbol of peace. Each pole carries the energy of peace and awakens folks to ask questions about the pole: What does it mean? Who started this practice? Are they all around the world? 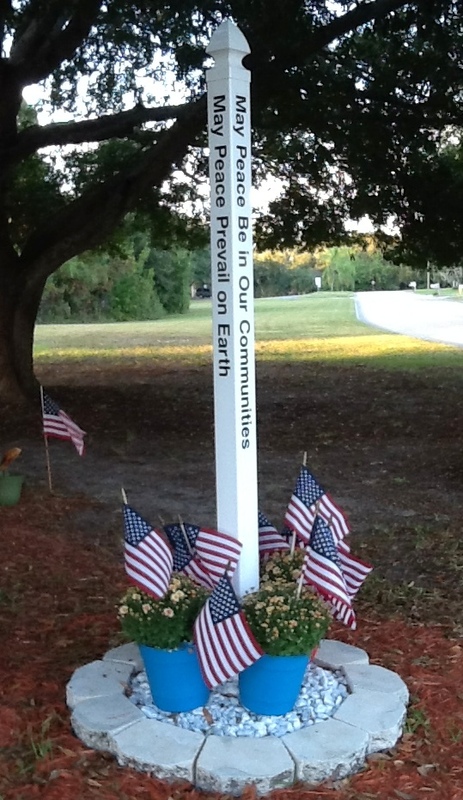 The VPP board has made a decision to donate peace poles to community groups such as schools, parks, civic centers, etc.. Once installed, VPP will participate in a dedication ceremony, if desired by the recipient. For example, on International Peace Day (September 21), VPP provided poles to two Montessori schools. The dedications at Island Village Montessori Schools involved 180 and 550 students, staff, and many of the parents in Sarasota and Venice, respectively. To view the pole your donation will help provide, click on photos below. May peace prevail in your heart.